The star of Apple's Worldwide Developers Conference this year was clearly iOS 7, which gets a new look and a raft of new features. Officially slated for release sometime this fall, it's already in the hands of developers, giving them a few months lead time to update their apps and prep for the rollout -- likely at the same time new iPhones are released. iOS 7 represents a fairly fresh approach to on an already successful design. And while there will inevitably be changes before the final version arrives, the preview version shows the direction Apple is moving and gives a broad look at what's in store for iPhone, iPad and iPod touch users later this year. Based on some time with the preview, here's my thinking on what Apple is up to, and why it matters. As iOS matured since it first arrived in 2007, Apple gradually added new features and capabilities. But the overall look remained pretty much the same. Not so in iOS 7, which delivers an interface overhaul that's been a long time coming. Where iOS 6 and previous versions featured an emphasis on graphical decorations to convey information -- for example, glossy effects around buttons and textures like linen and felt to fill empty space -- iOS 7 uses solid colors and a thinner font set free of borders. It's a cleaner look that focuses more on displaying content, with many interface elements that were once framed by ornamental graphics now filling the ENTIRE screen. The new iOS design makes one thing clear: content is king, and everything else should get out of the way. iOS 7 features a different color scheme, as if the folks behind Flower Power iMac and the new iPod touch models had stormed into the design office, raised their minimalist, multicolored pirate flag, and looted all things shiny in iOS. The result is a brighter, more minimalist interface than iOS users have grown accustomed to. It's not unlike the text-centric Windows Phone, melded with shades of iOS past. In the past, Apple's OS tended to reflect the hardware. OS X was all cute and bubbly when iMacs were key, but as the iMac line became more sophisticated, so did the color scheme of OS X. I do wonder whether the iOS color scheme will be reflected in upcoming hardware, especially now that Apple design guru Jony Ive is leading both hardware and software designs. If you're afraid of change, you can take comfort in the fact that iOS still bears more than a passing resemblance to previous versions, and navigating the interface is just as simple as before. You still get a home screen with app icons, and you'll still be swiping up and down and side to side. The main difference between iOS 7 and previous releases is that the update leaves you feeling that every design element has gone through a formal vetting process by someone who had many nits to pick about the way things looked and behaved before. This is a confident design where all of the elements hang well together. From the moment you hit the home button and the lock screen pops up, you'll notice some different, but subtle, changes. When the display comes on, for instance, instead of snapping into view, it fades to life. And when you turn the device off, the screen fades to black. There is a distinct feeling of depth throughout the OS, a reflection that the user interface has been sectioned into layers. Nowhere is that more evident than with the use of parallax for home- and lock-screen backgrounds; depending on how the phone is held, the background image shifts beneath text and graphic elements. It delivers an almost 3-D experience, and was showcased during the WWDC demo. Unlocking the phone using a swipe-to-unlock gesture is no longer limited to a specific swipe area. Swiping left-to-right anywhere on the screen fades away the lockscreen, fades up the home screen background, allows app icons to glide into place, followed by the lower app dock. All of this happens quickly, and plays into the overall "layered" feel. Opening folders and launching apps now triggers a zoom-in animation that reminds me (geek alert!) of the level transitions in the game Flow (there's an example at the one-minute mark in this video -- or the animation used for the stellar cartography scene in Star Trek: Generations. Tapping a folder and launching an app zooms the content into full screen view, as if you're plunging into the folder or the app. Quitting an app and tapping out of a folder triggers a zoom-out effect. Double-tapping the home button launches the new multitasking bar, which springs into view by pulling back on the on-screen interface, displaying app icons and a screen shot preview of recent apps, allowing you to swipe through them with now-familiar swiping gestures. From here you can quit background processes with an up-swipe gesture -- as if the app is being dismissed -- or you can tap to select the app and be plunged into it. Between the parallax background view and the interface layers, the feel of iOS 7 is a very stylized attempt by Apple to give spatial orientation to the interface. However, the new design is no more confusing than previous versions and the use of text instead of icons in some spots actually makes it easier to figure out what you're doing. Generally, iOS 7 retains much of the straight-forward interface concepts that have helped make the iPhone and iPad so popular, but this release uses animations more effectively to graphically convey exactly what is happening. It's similar to some of the changes we saw back in 2001 in the move from MacOS 9 to OS X. While Windowshade had its fans, OS X's genie effect and Dock combo was an easy visual metaphor to grasp, especially for novices. The same is true here. OS has always had an interface that scales with experience, one that's easy enough for a three year old to use and powerful enough for rocket scientists. So rule No. 1 should be to not mess with the workflow too much. Thankfully, despite the new look and feel, iOS is still iOS. There is still an emphasis on one-handed operation, with modest improvements to step up that convenience for users. The Notification Center may still require a bit of stretching to activate, but access to common system controls via the new Control Center is a breeze. And the layout of Control Center seems to be designed to accommodate one-thumb control, as it covers the bottom two-thirds of the screen. New to iOS 7 is the ability to navigate by swiping from the left edge of the screen, though it will be up to developers to take advantage of the feature for it to achieve full success. Currently, most system apps do, and I imagine that number will expand as the final release date approaches. Spotlight searching is now available with a swipe-down gesture from anywhere on the home screen, making it much more convenient for regular use. And Siri, as shown at last week's demo, gets some improvements, with a new look and extended routines, new voices and added voice actions. You can now use Siri to control system settings like enabling/disabling bluetooth and turning on Airplane mode. Making changes, even minor changes, is almost always divisive and polarizing. There are always going to be critics. 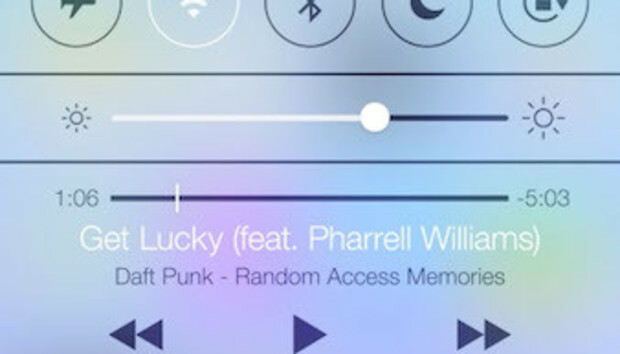 But what I see in iOS 7 is the public reveal of the culmination of months of hard work by the Apple design teams. In other words, this interface didn't just happen; Ive didn't sketch this on a napkin days before WWDC. I don't buy the talk that iOS 7 is a declaration of war, or that Apple's "cool factor" is back or anything overly dramatic like that; this isn't about being cool. The only thing iOS 7 does is finally show the cards Apple execs have kept secret during a long period of radio silence. This is just what the teams at Apple do, and have been doing since the return of Jobs in the late 1990s. Sure, iOS feels different than previous iterations, but functionally, it does the same things. From what I've experienced, Apple engineers knew when to say no; lines were drawn where they needed to be, and the new features -- in concert with that restraint -- will be appreciated by users once start working with iOS 7 themselves. Computerworld's Ken Mingis chats with Keith Shaw about Apple's Worldwide Developer Conference keynote, where the company unveiled iOS 7, a new desktop OS and new MacBook Air and Mac Pro models. This article, First Impressions of iOS 7, was originally published at Computerworld.com.